At WURTH, we carry a broad range of professional-grade automotive electrical supplies including batteries, domestic and import bulbs, electrical wire, cable ties, electrical tape, fuses, heat shrink tubing, rubber grommets, and automotive electrical connectors. Our extensive offering of electrical assortments include all of our most popular bulbs, solder slugs, fuses, rubber wiring grommets, connectors and tie straps in various sizes. 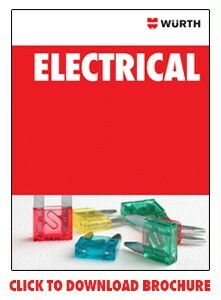 To see our complete line of electrical supplies, visit our online catalog.